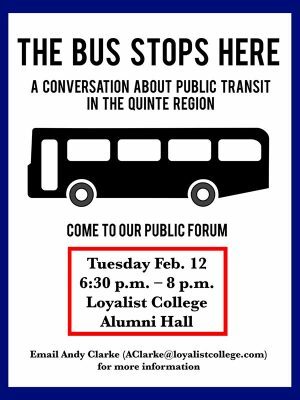 BELLEVILLE – On Tuesday, Loyalist College Journalism and Communications students will be hosting The Bus Stops Here, a public forum about the possibility for a regional transit system in the Quinte area. The event will be held in the college’s Alumni Hall from 6:30 to 8 p.m. Tuesday. The public is welome and encouraged to attend. The forum is part of a multi-part project that a group of four Journalism and Communications students have been working on. Sarah Law, a fourth-year Trent-Loyalist journalism student, has been spearheading the project. She said she got the idea after doing an interview with Fred Pollitt, the director of student life and leadership at Loyalist College and a non-voting member of Belleville city council’s transit advisory committee. Pollitt told Law he’d like to see an integrated regional transit system to better allow students to get to and from the college and around the area. The students have published stories trying to shed more light on the issue and different perspectives on transit. These include: Is a regional transit system possible in the Belleville/Quinte West area?, Regional transit: co-operation among municipalities is the key, advocates say, Transportation a key issue for Quinte-area seniors, especially in winter and Walking in a winter wonderland – on the side of Highway 62. Law says she hopes Tuesday’s public forum will be a culmination of their project, but that it will just be a starting place for the public. “The ideal outcome of the event is that we have a good conversation about transit, we get different perspectives to come forward, so different people can hear everyone’s perspectives and take away a better sense of the possibilities moving forward,” she said.